Stairways, Inc.’s standard bolt together spiral stair kits are versatile. These spiral stairs can be used for both, interior and exterior, applications. The photo shown here is a standard code compliant spiral stair model with an aluminum handrail, which was substituted for steel, at the same cost. Step options include wood, aluminum, and steel with plasma cut patterns, checker plate, bar grate and radial grating. Handrail options are all of our wood profiles, available in any wood species; steel, aluminum, stainless steel, brass and vinyl. Vinyl is the best choice if cost is a concern or if you are not sure of the rotation; and vinyl can be used clockwise or counter clockwise. The balusters on this model are limited to a ¾” square or round. A number of castings and ornate elements can be used with the ¾” square or round balusters to complement your decorating style. Our standard finish is a wet primer. Other available coatings for the standard spiral stair kit are black enamel, powder coating and galvanization. 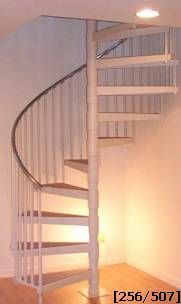 Let Stairways, Inc. design a standard bolt together spiral stair kit for your next project.